I'm creating my very first GUI using GUIDE for a DAQ application. I am able to pull the data sets from the instrument, place them in different handles and plot each or all of them using different push buttons. However, I would like to be able to place the acquired data passed to handles that was plotted into an array to eventually write it to an excel worksheet. I have the function for the "Save Data" button at the end of the program. I have tried a few options to save the array, but my program stores the entire sturcture and I get an error code when trying to load it. Error message: Warning: Unable to load .NET object. Saving (serializing) .NET objects into a MAT-file is not supported. What are you actually trying to save when you get that error? Don't save the handles structure. Pull your data out of it into its own variable and save only that variable as e.g. Thanks Adam. I was trying to save the data passed to the handle. P.S. - When I try to load "data", it sends out the error and adds the entire structure to the workspace. I am only trying to get the numbers in "C" that was used to plot the graph. What is the value of handles.C? Could you share a sample of that data so we can see it? handles.C does not appear to be a graphics object so you should not get() it. You might be accidentally doing get(0) and 0 is the graphics root object . I've modified the code. I no long try to get "C" or "handles.C." I fould that I can just use "Save('C')" and it saves "C.mat" to the current folder. 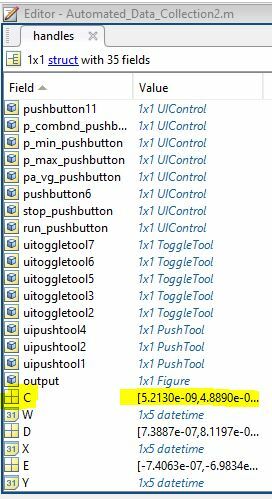 Cannot access method 'ActionData' in class 'matlab.ui.eventdata.ActionData'. " However, it saves it to the workspace. Please see the attached images for more context. handles.C is not a graphics object so you should not get() it. You should just use the contents directly. You might be accidentally doing get(0) and 0 is the graphics root object . Or you might accidentally be getting some other object, just by chance. I modified the code. I no long try to get "C" or "handles.C." 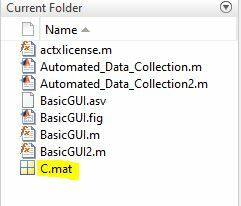 I fould that I can just use "Save('C')" and it saves "C.mat" to the current folder. It still doesn't give me a simple way to save the data that I am looking to save. Decided to take a chance trying save('handles.C'), but it spits out a corrupted file. Walter, it worked! Thanks so much. Much appreciated. Adam, thanks too for your help.